Our range of products include pressure vessel, cartridge filter housing, bag filter housing, sanitary filter housing and sterile filling vessel. View glass provided to check the liquid level in the filling vessel. Mobile Trolley with Castor wheels. Vessels can be Autoclaved or can be steam sterilized in-situ. Model One Round & Multi Round. Cartridge Filter Housing Cartridge filter system offers wide range of flow capacities contaminant holding capacities. Cartridge filter housing diameters can accommodate around 1 to 500 cartridges. Cartridge filters are normally used as polishing filter in almost all process industries. Cartridge filter is constructed of filter housing, filter cartridges, tube sheet, positive sealing arrangement for cartridge depending upon type of cartridge choice of end connections. Positive sealing arrangement for cartridge filter assures no particle migration or fiber migration, even after high differential pressures.OperationContaminated fluid enters the housing and is distributed evenly around the filter cartridges. Filtration takes place from outside to inside. Solids are collected on the outside of filter cartridges clear filtrate is collected at outlet. Size/Dimension 7" X 32" , 7" X 17" , 7" X 8"
Bag filter system is designed for optimum filtration performance. Its range provides filtration solution for a broad variety of fluid applications in the process industry. They are particularly useful for filtering large volumes of high viscosity liquids. Bag filter is constructed of filter housing, filter bags, internal cage to support bags, positive sealing arrangement, choice of end connections. The internal support ensures bags will not burst as high differential pressures build up during operation. Operation Unfiltered fluid enters the housing and is distributed evenly around the filter bags. Filtration takes place from inside to outside. Solids are collected on the inside of filter bag for easy removal. The filtered fluid then exits through the outlet pipe. 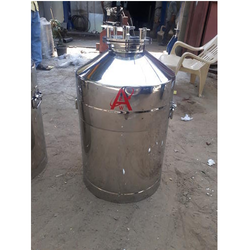 Sterile Filling Vessel Sterile Filling Vessel is extensively used in pharmaceutical Industry for the production and Packaging of infusion and injection solutions. 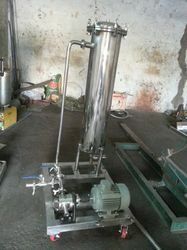 The filtered sterile liquid stored in the vessels can be directly drawn out by the filling machine syringe.Filling vessels are used in the Membrane filtration system. While pressure vessels are used to transfer the product to the filter under Nitrogen pressure, the filling vessels are used to collect the filtered sterile solution. They work as buffer vessels in the product filling room. It is a specially designed for sterile solution.The vessel shall be made out of 316 quality16swg. SS sheet. An air vent inlet nozzle shall be provided on the top for air pressure. An out let nozzle fitted with long pipe to draw liquid from the vessel shall be provided. A toughened glass for visual inspection shall be providing on top. The vessel shall be argon welded with smooth finish on the corners and highly polished to mirror finish from inside outside. Two SS handle shall be provided for lifting.